No sooner had Kutta pulled the handle than did the door burst open, knocking her sideways, and Vimbo lunged into the room. Mhumhi gave a stuttering growl, opening his jaws, but the hyena arrested his own momentum as soon as he was past the threshold. He lowered his blunt head and looked all around, his eyes rolling, his jaws open. Mhumhi looked back and saw that Kebero had flattened himself into the corner, his eyes wide and petrified, and that Bii had doubled his size again, puffing out with everything he’d got. Mhumhi felt a mean sense of satisfaction that maybe the bat-eared fox was regretting this plan after all. Kutta rolled to her feet and went around to stand by Mhumhi, the hair on her own back rising, staring down the hyena. Mhumhi swallowed his unfriendly feelings and looked more critically at Vimbo. The hyena was standing with his haunches low and his front legs splayed, like an awkward puppy, but his short tail was curling up over his back. “Vimbo!” Mhumhi called, and the hyena’s head swung over to look at him. Mhumhi felt a strange little jolt as their eyes momentarily met directly- for a second he had felt like there was almost an awareness behind those eyes, beyond that of a mere animal. But it was not there a moment later, because, he realized, Vimbo was only responding to hearing an unfamiliar voice call his name. Anyway, he’d got the hyena’s attention, so he walked over stiff-legged, keeping his teeth bared. That also seemed signal enough for Vimbo, for he lowered his head, giving a little keen, and let Mhumhi sniff his coarse mane. It was not, Mhumhi thought, wrinkling his nose, the most pleasant sniff, because of course Vimbo had that ever-present hyena reek, even if it seemed as though he’d been bathed once or twice before. Mhumhi was not highly accustomed to it, so there wasn’t terribly much else he could discern, aside from the fact that the hyena had been scared recently, and the faint traces of Jabulile’s blood still around his muzzle. “No, no,” whimpered Kebero, pressed into his corner. One of Vimbo’s ears turned towards him, and then the hyena swung his head around, sniffing at the air. He took a step towards Kebero and the wolf whined. “Vimbo,” said Mhumhi, and Vimbo looked at him again, then at Kutta, who was shifting her weight slightly from her tensed position. “I don’t like his eyes,” she said, voice low. Vimbo seemed to start back a little at the sound of it, then come sniffing forward again. This again made Vimbo raise his ears and he thrust out his head to look across at the fox. Mhumhi glanced back as well. “Mhumhi!” cried Kutta, and he jumped away. Vimbo had shot forward, but not at Mhumhi- he was intent on Bii, his mouth hanging wide and his tail raised. Bii gave a little shriek and turned to run. Mhumhi jumped to bite at the hyena’s haunches, making him give a little laughing squeal. There was a blur of movement on the other side and suddenly Kebero was standing over Bii, giving a shrill little growl. Vimbo stopped short, bobbing his head up and down and keening. Kebero was quivering, as he was a third of the size of the hyena, Bii a huddled lump with flattened ears between his forepaws. Mhumhi reared up and bit the top of the hyena’s haunch again, though his teeth did not break the skin. Vimbo gave a distressed little giggle and whirled back on him, his ears flattened. With a growl Kutta came at him from the side, rearing, and drove her teeth into the area between his hairy neck and his shoulders. Vimbo yowled, squatting low, as Kutta worked her teeth from side to side. “Kutta!” cried Mhumhi, jumping back- he had wanted to drive the hyena off, not make him more violent! Vimbo was trying to run away from her, half dragging her as he wailed, pushing past the startled Kebero; but she did not let go. Finally he flattened himself to the ground. Vimbo stayed down, looking throughly intimidated, rolling his eyes up at her. “Isn’t that a bit much?” said Mhumhi, wondering if he ought to reminder that Vimbo couldn’t even understand what she was saying. He stopped, because the look Kutta was giving him was now shocked and disgusted. The fur on Mhumhi’s back rose, his eyes widening, and he stared at his sister. “Fine,” said Kutta, snapping her jaws together, and she turned her head away. “See if you can spot an empty home or two. 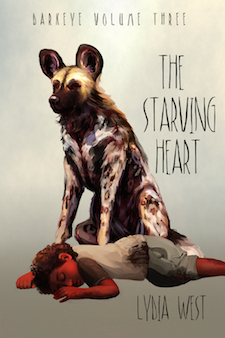 And if the police have left hyena corpses around, I suppose we could eat from them.” Her eyes flashed towards Mhumhi again, as if daring him to protest. “Go on, get out of here, Bii,” said Mhumhi, shooting him a glare. The fox whisked his tail. “I want to go with you,” said Kebero, his brow wrinkling sadly, and went down on his elbows to try to lick under his chin. Bii put a paw up on his nose to push it away. Kebero flattened himself to the ground in what seemed to be abject misery. Bii whisked his tail and quit the room at a trot. Vimbo did not move to get up, but Mhumhi noticed his eyes and ears tracking the little fox as he went by. When he had gone, Kebero moaned, “I wish you’d let me go with him!” and rolled onto his side with his back facing them. Mhumhi wondered when he’d got so petulant. “Mhumhi,” said Kutta, and Mhumhi went tense again. “What,” he said, letting the word come out flat and looked back at her. They were silent for a moment, just standing close to one another. Mhumhi felt a sort of deep relief, for just a moment, listening to his sister’s heart beat beside him. Mhumhi did not answer straightaway, digesting this. Some small spark of frustration welled up inside of him… He did not want to be the deciding factor for this plan’s execution. But that was a stupid, selfish thought. He heaved a sigh. “I want the puppies back.” He had known this even in the moment when he had left them- he was going to come back. When she trailed off, Mhumhi knew that they were thinking the same thing, of how safe the children were now, in the hands of their own kind, with the police none the wiser as to how to get to them. Mhumhi felt heavy guilt weigh down on his heart. Could he really stand to do this? “Maybe,” said Mhumhi, though he did not think it was a fate he’d wish on anyone, even Biscuit. They were interrupted by a sudden rustling- Vimbo was drawing his paws underneath himself, as though he was going to get up. Kutta growled at him and he flattened his ears and opened his mouth. “He’s all right, I think,” said Mhumhi, and Kutta turned an ear towards him and reluctantly ceased her growl. Vimbo was staring at her now, and he crawled a little closer to her, keening, and then pushed himself up. Much to Mhumhi’s alarm, the hyena proceeded to turn sideways and raise his leg as though he was going to urinate. “Ugh!” cried Kutta, jumping away, for she’d been right where the line of fire had been, but that had apparently not been Vimbo’s intention, for he shuffled around towards her with his leg still up. “What is he doing?” asked Kutta, eyeing the hyena with alarm as he continued to stand, his other rear leg trembling slightly from his own weight. They let Vimbo stand there for another moment before he put his leg back down, looking vaguely bewildered. He took a step towards Kutta and when she growled put his ears back and bobbed his head. “What is he doing?” she demanded again, and this time Mhumhi did laugh. “I think you’ve got an admirer,” he said, and Kutta turned to give him a sharp bite on the ear. They sat and watched Vimbo together for a little while longer, for it was decent entertainment. The hyena seemed to be working out a puzzle in his own little mind, as he watched Kutta and crouched and rose and bobbed and occasionally let out a soft whine. At one point he curled and sat far back on his rump, stretching his hind leg up and out, to lick himself with more flexibility than Mhumhi would have thought possible. Mhumhi took the opportunity to look over at Kebero during this and found that his brother was watching the hyena as well. He still looked very unhappy. Kebero looked at him and then thrust his chin back down in the blanket. “We weren’t-” started Mhumhi, but Kutta cut him off by laughing. Kebero gave her a sulky glare and curled up again. “Hm,” said Kutta, licking her lips, and then glanced down. Mhumhi followed her gaze and realized that Vimbo had crept closer while they were talking, keeping his body close to the ground, so that his large head was now nearly resting between them. He rolled his eyes up at them and gave a little keen. “Seems we’ve got a new puppy to take care of,” said Mhumhi, bumping Kutta’s shoulder with his, so that she raised a lip. That got her to snap at him, and Mhumhi was still laughing when Kebero suddenly sprang to his feet. “He’s back!” he cried, and went to the door with his tail wagging furiously. A few seconds later Bii emerged through the opening. “Any sign of hyenas?” asked Kutta, turning her ears forward. “Not us,” said Kebero, wagging away. Mhumhi looked at Kutta, who sighed through her nose. They looked briefly at Vimbo, who’d raised his head to give Bii that penetrating look again. When he sensed Kutta looking at him, though, he turned back and resumed his saucer-eyed gaze at her. “I’ll stay with you,” said Kebero, wagging his tail and licking at the top of Bii’s head. He wagged his tail hard. He was in high spirits by the time they reached the large grate that Kutta had told him to swim through once. That seemed so long ago now- so much had changed. The ladder hanging down below the manhole, for instance. Mhumhi felt a little prick of anxiety, remembering how Maha had pulled it down just a few nights ago. That plan had ended badly… they would have to hope that this one would go off without a hitch. The sunlight was shining down over the ladder in a round patch, and Mhumhi wagged his tail. He had not seen sunlight in- well, certainly not since that night! He bounded up the ladder first, making it clatter and shake against the concrete, and leapt out of the manhole. At once something hit him and shoved him down and pinned him on his side. He was unable to produce anything but a strangled yelp. For a moment his senses were clouded by shock, but then he realized what he was looking at. It was a dense forest of dark legs- painted dogs, like him, surrounding the manhole, trotting and waiting as if they knew very well what to expect. But the one holding him down by the neck wasn’t a painted dog, it was a gray wolf, and its soft growl vibrated through his flesh. Kutta’s head poked out and she at once tried to back down, but another wolf sprang out and grabbed her by the scruff, dragging her kicking body out. “Now the hyena,” Mhumhi heard one of the painted dogs say, and he saw a group go forward as if they were going to go down the hole, but then they scattered, because Vimbo leapt out of it. The hyena gave a chattering whine, rolling his eyes, and loped around in a circle, scattering some of the painted dogs. Mhumhi felt a brief stab of hope and strained against his captor a bit. Vimbo looked over at him, his mouth open. Then he squealed as two dogs hit his rump, digging their teeth in, and a second pair came at his front, one taking him by the nose, the other at his throat. Vimbo gave a strangled wail, struggling, and Mhumhi saw him begin to bleed. Kebero jumped out of the manhole, and then Bii after him, the fox’s tail circling as he landed. One of the painted dogs growled an order, and their ranks parted. Mhumhi tried to sit up, gasping as the wolf’s jaws constricted his throat. Bii said something to the lead dog, and then kept walking, without looking back. Kebero did look back. His ears were flat against his head, his tail up against his belly. Then he walked on, and the ranks of painted dogs closed again, with Kutta, Vimbo, and Mhumhi all in their jaws.